"What do you mean, you wish I could stay this size forever?" Peter Pan refused to grow up, wanting to remain a boy forever. That's part of the appeal of miniature or dwarf cats. While there's nothing more fun than kittens, in just a few months the little guys grow into cats. Miniatures stay small for life. Miniature cats mature at about half the size of the normal adult cat. Most of these felines originate from breeding exceptionally small "common" cats to each other, then choosing the smallest members of those litters to breed with the hope of creating tinier felines. Unlike dwarf cats, miniatures have the same proportions as their regularly-sized cousins. Miniatures generally don't exceed 10 inches in height at the shoulder and 1 foot from neck to tail. At maturity, they shouldn't exceed 7 pounds. So-called "teacup" cats are even smaller, with a height of 6 inches at the shoulder and weighing 5 pounds or less. Although they stay small, miniature cats act like cats, not kittens. 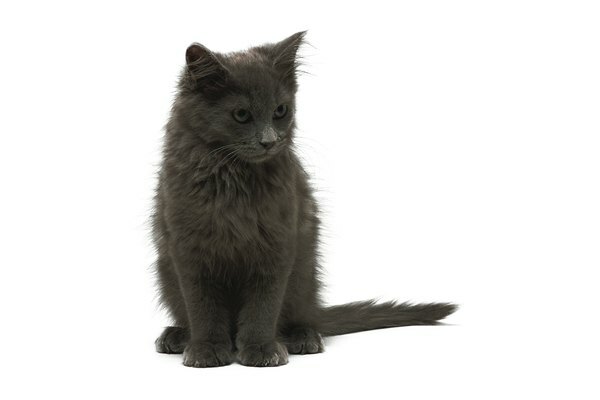 True dwarf cats result from a genetic defect and endocrine issues. While they're the same size as miniatures, they look quite different due to their disproportionate heads and limbs. Also known as chondrodystrophism, dwarf cats have short legs and somewhat larger heads. The long bones in their legs don't develop normally. Dwarf cat breeders must do their research to determine the mutation before mating a female cat. If the dwarf gene is dominant, rather than recessive, a female can conceive normal-sized kittens, which might be too small for pass through her birth canal. Even if a vet performs a C-section to save her and the kittens, the mother cat might not produce sufficient milk to nurse normal-sized babies. Probably the best-known breed of dwarf cat is the Munchkin, named for the little characters in The Wizard of Oz. When full-grown, Munchkins weigh between 5 to 9 pounds. They're an energetic breed, well-known for their good dispositions and playful natures. Munchkins result from a genetic mutation, so they are normal-sized cats on very short legs. For the most part, miniature cat breeding is a fairly new field. A true "miniature" cat should weigh 7 pounds or less when full-grown. Among the recently developed breeds is the Bambino, a short-legged cat with no hair. The Napoleon, a cross between a Persian and Munchkin, is a short-legged cat with a great deal of hair. Skookums are a Munchkin cross with a curly coat. The similar Lambkins also boast curly hair. Certain Persian, Siamese and other purebred cat breeders have also selectively mated small examples of their breed, producing miniature versions. Miniature cats are relatively rare and expensive. Because a breeder wants to ensure a cat stays small, you might not be able to bring your cat home until it's at least 6 months old. As an alternative, visit your local shelter. You're quite likely to find a small adult cat available for adoption. Is a Pansy Toxic to Cats? Can Poor Prenatal Care in Cats Cause Problems?